Lelo in Nopo: What the heck are you doing with all of that jam? Before I started making my own jam, I wasn’t a big jam buyer. So when my pantry was stocked with berry, peach, and strawberry jam after my first year of food preserving, I did ask myself a few times, “What the heck are you going to do with all of that jam?” Yes, they’re perfect for giving as gifts, but still. So I thought it might be helpful to share with you a few ways I’m using all of that jam. These are my favorite drop scones, you know the bones to this recipe. But instead of adding any nuts or dried fruit, I form the dough more into the shape of “jammers”, or scones with a center top pool of jam. 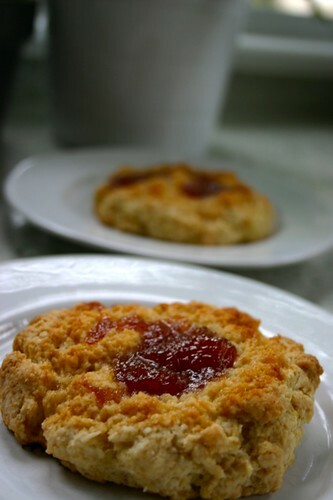 Big tablespoons of jam go into the specially shaped dough, and cook right along with the scone itself. In these photos I used my peach preserves: they’re pretty sweet and are perfect for this use. These scones were made for jammin’, and that’s just what they’ll do, these scones were made for jammin’ and they’ll jam all over you. I was just admiring my waaay too big jam "collection" (blackberry peach, nutmeg peach, banana peach, blackberry raspberry, tart raspberry). AND I made some scones from a 3-year old mix that turned out quite bitter. I need a scone do-over and something to help consume all the jam! Thank you! I love this idea. 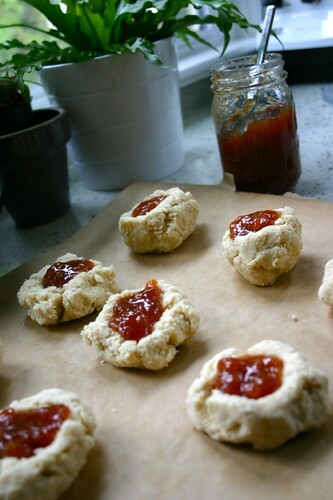 I'm going to shape my favorite scone batter into little nests filled with my favorite (no, not homemade) apricot preserves. Thanks for the inspiration! We talked about you yesterday. Were your ears burning? Six of us bloggers from POrtland met at JAM on Hawthorne for brunch. We talked about your great blog and how we need to get all of us together soon. Funny you'd post on Jam on the day we went to Jam!! Lewis, that would be wonderful. Now that explains why my ears were burning! As always, what you are cooking up looks divine! YUM. I may have to buy jam just to make this! Hey.....a blogger friend sent us his recipe for raspberry chocolate cake....that uses 1 jar of raspberry jam. THAT was good, so your post is timely. Nice post and timely with all the cooking season coming up. It's always nice to find ways to bring a piece of summer back to life when it's rainy and cold outside. It would be fun to make these over the holidays, putting out multiple flavors and letting guests choose what drops from jam heaven they get! the day you wrote this post, i was watching Giada's show and she made a frosting where you add jam. the whole cake looks great, but the frosting made me think of you and all that jam in your pantry.